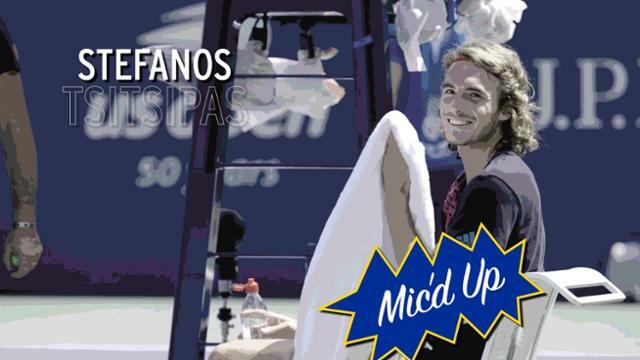 Stefanos Tsitsipas and Aryna Sabalenka have been named the 2018 US Open Series Breakout Performers after both rising stars elevated to new heights in the buildup to the US Open. Introduced for the first time this summer, the award recognizes one man and one woman at the beginning stages of their careers for a signature performance over the course of the five-week series. Both 20 years old, Tsitsipas and Sabalenka will now be seeded in a Grand Slam for the first time as they make their US Open main-draw debuts this week at No. 15 and No. 26, respectively. Tsitsipas made his breakthrough at the Rogers Cup in Toronto, knocking out four Top-10 players in succession to reach his first ATP Masters 1000 final. The Greek saved match points against Novak Djokovic and Alexander Zverev in the process and also defeated Dominic Thiem and Kevin Anderson to set up a championship showdown with Rafael Nadal on his 20th birthday. The best result of his young career, Tsitsipas' Rogers Cup run instilled in him the belief that he belongs at the top of the game. While Tsitsipas played just two US Open Series events – the Rogers Cup and the Cincinnati Masters – Sabalenka entered all four US Open Series tournaments on the WTA calendar. The Belarusian saved her best performance for last, as she won her first WTA title at the Connecticut Open on Saturday. One week earlier, she blossomed against an onslaught of top talent to reach the semifinals in Cincinnati, defeating former Australian Open and Wimbledon semifinalist Johanna Konta in the opening round before taking out WTA Top 15 players Karolina Pliskova, Caroline Garcia and Madison Keys. Out of all of her giant-killing victories over the past month on her favored hard courts, Sabalenka remembers her Rogers Cup win against world No. 2 Carolina Wozniacki, the reigning Australian Open champ, as the one that set the stage for her breakout summer. “The win over Wozniacki was a great win. After that I started to believe in myself even more,” she told USOpen.org. But like Tsitsipas, she is not getting ahead of herself. Sabalenka was quick to downplay the significance of being seeded for the first time at a Grand Slam. It is yet another landmark moment for Sabalenka, just as it is for Tsitsipas. “My goal was to be seeded at the US Open, but as it looks, I went too far,” he said with a smile. “I believe I deserve the spot, and it shows how much I worked to get to this place. It means a lot to be the No. 15 seed at the US Open." For both of the 2018 US Open Series Breakout Performers, they can start getting used to it. SEE ALSO: Arthur Ashe Stadium was rocking and rolling on Saturday, as the biggest stars in tennis and music took to the courts for a fun-filled show for the family.